You are currently browsing articles tagged Wounded Warriors. The Annual Veterans Conference put on by the American Veterans Center is always a special event, dedicated to preserving and promoting the legacy of our brave servicemen. They did not fail once again to put on a splendid event this November 9-11. 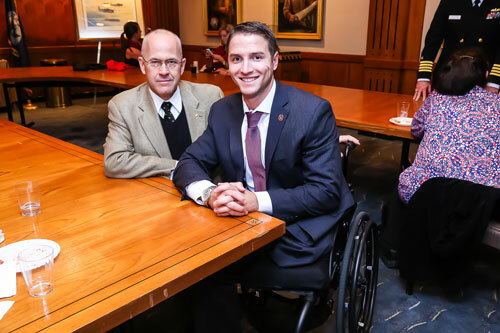 The first evening’s event featured a panel of Wounded Warriors. During the reception beforehand, I was surprised when one of those warriors, Corporal Garrett Jones from Newberg, Ore., happened to sit across from me for cocktails and hors d’oeuvres. It turned out to be one of the most memorable conversations of the event. What struck me most about this 28-year-old Marine was the utter absence of self-pity in spite of the fact that he was an amputee. He told the gripping details of how he lost his leg while serving in Iraq back in July of 2007. When a 155mm Improvised Explosive Device (IED) was detonated under his feet, he was thrown into the air like a rag doll. He never lost consciousness and attributed his survival to the “grace of God.” He thought he was dying because of the difficulty he had breathing. He then started feeling very cold from loss of blood and felt his death was certain. This no-nonsense Marine described his reaction when he heard his unit would be deployed to Afghanistan after his injury. “I am going with you,” he informed his commander in a very decisive way. With the help of higher ups including the then-Marine Corps Commandant, Gen. Conway, he did in fact deploy the following spring. During the following day’s Veterans Conference, attendees were treated to a wide variety of heroes and legends. Medal of Honor recipients Gen. Patrick H. Brady and Staff Sgt. Clinton Romesha were part of one panel. They took questions from the audience while the Congressional Medal of Honor Foundation President and top gun pilot, Maj. Gen. Thomas Wilkerson moderated. Like most recipients of the Medal of Honor, both men showed great humility in wearing our nation’s highest honor for valor. The highlight of the conference however was the Honors Award Banquet. Doris Day, the charming and gracious widow of Col. Bud Day was there to accept The Doolittle Tokyo Raider Wings of Valor Award that was posthumously awarded to her late husband. With her always sparkling blue eyes, this wonderful lady expressed her gratitude and explained how Jimmy Doolittle was her husband’s hero. The last living member of the legendary Navajo Code Talkers, Chester Nez was also on hand. During World War II, the Japanese broke every code devised by Americans except the one devised by a Navajo Indian named Philip Johnston. His undecipherable code was based on their language and was so effective that the 29 original code talkers could communicate in 20 seconds what it previously took coding machines half an hour. Mr. Nez was only a tenth grader when Marine recruiters came to his boarding school looking for young men who were fluent in both English and the Navajo language. He jumped at the chance to serve his country, lied about his age, and signed on with the Marines. He was the first of the original Code Talkers, which took part in every Marine assault in the Pacific. They sent thousands of messages that baffled Japanese military cryptologists who were unable to decipher a single one. The most special part of the evening however was the moment when the late Chris Kyle was posthumously awarded the Paul Ray Smith Award. It was difficult to restrain one’s emotions as a moving video tribute of this All American Hero was projected on screens at both ends of the room. 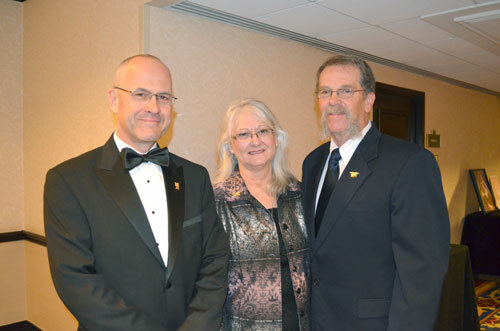 His parents, Wayne and Deby were there to receive the award on behalf of their fallen son. As a Navy SEAL sniper, Chris Kyle racked up an astounding 160 confirmed kills during his time in combat, a US military record that is unlikely to be broken. 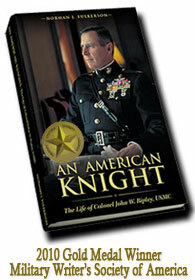 He was so deadly he earned the nickname, The Devil of Ramadi by the enemy who placed an $80,000 bounty on his head. His life was brought to an abrupt end when he was shot and killed by a Marine suffering from PTSD that he was trying to help. As his grieving parents walked on stage to receive the award, the audience erupted with a standing ovation that seemed to go on forever. I personally could have clapped until my hands were bleeding for that man. As the evening winded down, conference organizers explained the significance of the bottle of Hennessey Cognac sitting at the center of each table. As we were celebrating heroes in our nation’s capital, another crowd at the Air Force Museum in Dayton, Ohio was honoring three of the last four remaining Doolittle Raiders. This heroic group of pilots conducted the retaliatory raid on Tokyo, Japan after the infamous attack on Pearl Harbor. Their historic feat had the double result of lifting American moral and demoralizing an intransigent enemy that thought they were invincible. In 1959, the city of Tuscon, Arizona presented the group with 80 sterling goblets etched with the names of all the original Raiders and a bottle of 1896 Hennessey Cognac in honor of the birth year of their founder Jimmy Doolittle. At each yearly reunion since then a tradition was born. The remaining living members would toast those who had passed away on the previous year, then turn the goblet of the deceased upside down. The original plan was to save the 1896 bottle of Hennessey for the last remaining Raider. With the death of Thomas Griffin earlier this year and the failing health of another, it was decided to bring this extraordinary tradition to a ceremonious end. As the remaining Doolittle Raiders were making their last toast, attendees of the Veterans Conference were with them in spirit. It was a chilling moment as the shining amber liquid was poured into each of our goblets. This spine-chilling event gave me time to reflect on the previous days’ events. 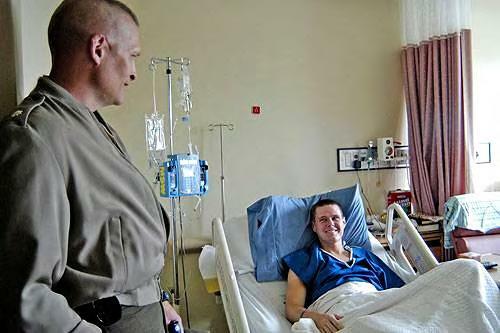 Lt. Col. Tim Maxwell visiting a wounded warrior. His upbeat spirit never fails to encourage those in most need. Since writing that piece, on this true American Hero, I have received news from friends about Colonel Maxwell’s medical condition. It is not good. However, Marines who know him personally have told me that he accepts his many illnesses with an admirable patience. The most amazing thing about this man is that, in spite of his wounds, he continues his excellent work for other wounded servicemen through Semper Max Mission. Please keep this true American Hero in your prayers. You have not heard from me in quite a while. For the last 2 months, I’ve been on vacation. Free! Yup, it’s been great. If you have never been on the Bethesda National Naval Medical Center vacation ship, you don’t know what you’re missing! OK, it’s time for the truth. It took 2 weeks for the Orthopedic Doctor to admit that he didn’t know what to do. Finally, he went to his boss, who immediately contacted Dr. M. She is a wrist/elbow expert. She immediately made me and inpatient at Bethesda NNMC. The next day she went in my arm and removed the steel that had been there since 2004. The infection had not gone to my elbow, as the initial doctor thought. Apparently, steel attracts infection. Go figure. She told me that when she had open my arm puss had poured out. I had surgery 2 more times over the next couple of weeks. I’m not a big surgery fan. To fight the infection I had a pic lines inserted in my upper arm. That is run through your veins to your heart. Like an IV that lasts for 4 weeks. Good news in that every time, I say again EVERY TIME, someone tries to give me an IV, they fail. Usually it takes 3 attempts, with 3 different people. It has always been that way. No idea why, but it is. It had gotten so bad, I had an IV in my throat/neck. I was running out of areas available for an IV. So the pic line seemed good. But, alas, it also got infected. I went back to the hospital and had it removed. Thankfully, the infection was not too bad. That’s the good news. The bad news? The medicine that I am now taking is causing quite a few problems. 2000 mg of any medicine is too much. But it was messing up my brain. I took that much for several weeks. No one knew that that was the problem I was having. My neuropsychiatrist, Dr. W., has been involved the entire time. He knows about my surgery and my medicine. So we kept modifying my medicine, not including the penicillin, trying to fix my new problem. Changes were not working. So I contacted the infection specialists and asked him if I could reduce the amount from 2000 mg to 1500 mg. In spite of the severity of his injuries, Lt. 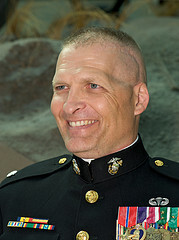 Colonel Tim Maxwell is still capable of smiling as he continues to fight the good fight. This just happened 3 days ago. So far, things are much better than they have been in some time. Having conducted my own research over the Internet, I found out that this type of penicillin I am taking can cause “confusion”. Pretty good explanation of my problem. Of course, seizures are a big concern of the doctors. Like the arthritis arguments, many doctors think I am having mini seizures. And like the arthritis, I know they are wrong. So from June 14 to August 8, I have been miserable. On top of it, my computer is all screwed up. I had to have a specialist come and fix it. Then, I find out that the company, *****, has subcontracted all e-mails. In the new company, whoever it is, has decided that I can only send 50 e-mails at a time. 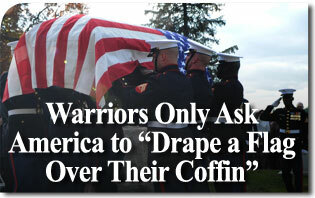 Given that I e-mail 500 wounded warriors and 1000 supporters, it’s a little tough. Still working on this, actually. I wish I had a better story to tell everyone.